Dr. Michael P. Lateiner, “Dr. Mike,” received his Doctor of Dental Medicine degree (D.M.D.) from the University of Medicine and Dentistry of New Jersey in May 2005. He then spent an additional two years there to earn his specialty in Pediatric Dentistry and a Master of Science in Dentistry. Dr. Mike completed his undergraduate degree at Fairleigh Dickinson University in Madison, NJ, in May 2001 with a bachelors of science in Biology with a minor in Chemistry. 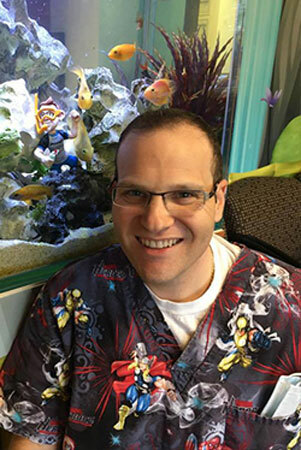 He is currently on staff at Morristown Memorial Hospital where he teaches and shares his knowledge by training the Dental residents. Dr. Mike has been a Board Certified Pediatric Dentist since 2009 and has been named one of “NJ’s favorite Kids’ Docs” in New Jersey Family Magazine. Outside of work Dr. Mike enjoys spending time with his family, staying healthy by working out and of course cheering on the NY Yankees and NY Giants. Dr. Mike married his wife Gloria, who is also a dentist, in 2010. They have two children, Dylan, born in March of 2012 and Sasha, born in October 2014.